There are currently 94 people online. 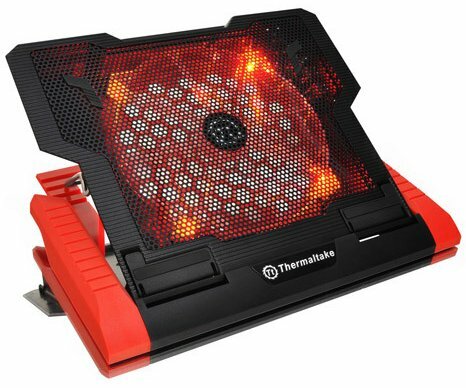 ThermalTake launched the Massive 23 GT, a new notebook cooler with a 200mm red LED fan. Thermaltake continually revolutionizes the market by creating, innovating and implementing the most efficient solution on the products which designed to provide maximum performance to gamers of all levels. With the “deliver the perfect user experience” as the determinative mission, Thermaltake this September is globally introducing the new Massive 23 GT Notebook Cooler which continues the illustrious features of Thermaltake “Massive23 LX” and “Massive23 CS”, and excitingly takes it into future. The design idiom accentuates its lively, stylish and passionate presence. The same applies to the functionality. The new Massive 23 GT Notebook Cooler blends flip-up valve design with five different angles adjustment with ergonomic typing angle, high airflow 200mm red LED fan decreases temperature, multiple applications for notebook and tablet PC, such as iPad, its fan speed control from 500 to 800 RPM, dual USB and one mini USB ports for expandable usage for everyday uses, top performance with exemplary for keeping notebook components running at optimal temperatures and creating the perfect atmosphere for the users! This summer, the easy carrying Massive 23 GT Notebook Cooler will put out the fire in games and cool the battling gears for gamers to achieve best effectiveness in FPS, RPG, MMORPG and RTS gaming competition. The New Massive 23 GT Notebook Cooler is not only an optimum thermal cooler stand which support all 10” to 17” notebooks/ laptops, with special design flip-up valve, it could easily transform and hold some of the hottest tablets on the markets, is an all-rounder cooler stand that will electrify the gaming sensation. Featuring with a stylish 200mm red LED fan (with 500~800RPM fan speed) which is specially engineered to provide excellent airflow. In addition, the on/off red LED fan control switch will allow easy fan access without the trouble of plugging/unplugging the Massive 23 GT Notebook Cooler while during game or off game times as well as the red LED light effect will stimulate gamers’ visual senses simultaneously. The Massive 23 GT Notebook Cooler is designed to enhance the cooling mobility when the gamers are often on the roads or traveling around the world with their gaming notebooks/laptops and tablet PC. It weighs less than 1Kg, with its dimension of 352 x 293.1 x 41.4 mm, it could easily be fitted into all gaming notebook/laptop, also tablet PC, carrying bags and can effortlessly be transported to any battle station. Additionally, with special designed 5 different ergonomic angles adjustable stand offers the best possible viewing positions.